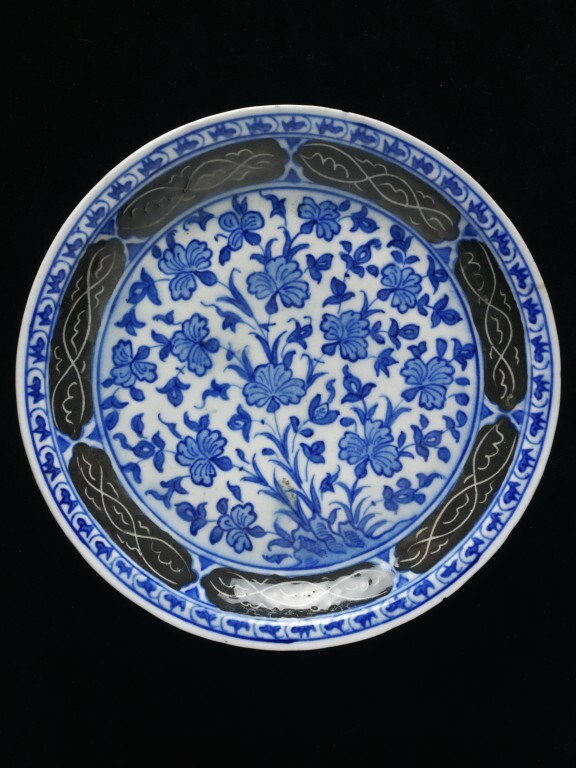 This is a ceramic plate made of a stonepaste body, glazed and decorated in two blues and black. Made in the late-17th century by Persian potters imitating Chinese designs, the heavy dish has an orange-peel glaze. A single row of sketchy scrolling leaves fills the flange and the interior well is decorated with seven black cartouches. The central stem of a flower spray rises from a small mound with its thirteen flowers. Plate, glazed stonepaste, with blue flowers in the centre, the hollow brown with incised pattern, and blue rim. A single row of sketchy scrolling leaves fills the flange and the well is decorated with seven black cartouches with a sgraffito double scroll. The central stem of a flower spray rises from a small mound with its thirteen flowers. Three fine S-stems with a central lotus leaf and smaller sketchy leaves surround the outside. Three crossed leaves act as dividers. The heavy dish has an orange-peel glaze. Historical significance: The use of a black band on the interior well of the plate was first noticed on a medium-sized dish dated 1065/1653 and lasts until the end of the century. 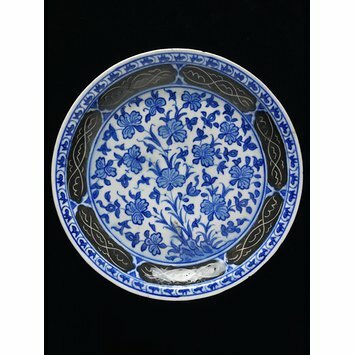 The late 17th century, when this plate was produced, was a lower period of creativity among Persian potters which was linked to a feeling of insecurity due both to the shift of emphasis in taste and to the pressure to produce a whole range of sizes and shapes required by a foreign market. These Persian ceramics had only a limited trading value in Persia itself though for local use Persian faience, as Chardin reported, was made all over Persia with the best pieces coming primarily from Shiraz and then Mashad, Yazd, Kirman and Zarand (A. Lane, Later Islamic Pottery, London, 1957, reprint 1971, 120).